Beat egg yolks well in medium bowl or glass measure; gradually stir in milk until blended. Cool quickly: Set pan in larger pan of ice water. Stir occasionally and gently for a few minutes to hasten cooling. Stir in vanilla extract. Press piece of plastic wrap onto surface of pastry cream to prevent "skin" from forming. Refrigerate until thoroughly chilled, at least 1 hour. Plan ahead: Make pastry cream well in advance, so it can chill thoroughly and thicken up. 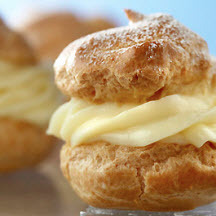 A hot or warm filling will make pastries soggy. Nutritional Information Per Serving (1/12 of recipe): Calories: 95; Total Fat: 2g; Saturated Fat: 1g; Cholesterol: 57mg; Total Carbs: 15g; Fiber: 0g; Protein: 3g; Sodium: 76mg.